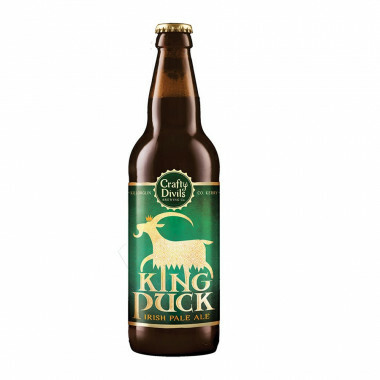 King Puck is a craft beer from the Irish brewery Crafty Divils. Its an Irish Pale Ale with a golden colour. The aromas of hops bring floral notes, citrus and spices. 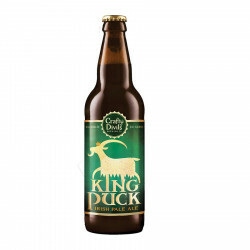 The King Puck beer is a craft Irish Pale Ale. Blond and hopped, it holds a depth of flavour with notes of citrus, spicy and floral aromas. Participants go to the mountains of Kerry and try to catch a wild goat for a walk in the town of Killorglin. The most beautiful is elected "King Puck" and reigns during the 3-day festival to celebrate this tradition of more than 400 years. This beer is easily adapted to dishes, from salads to meats and seafood. After several years of testing with buckets, pipes, thermometers and sterilisers, Roisin and David were ready to launch their tasty beers in the trade. Crafty Divils aim is to provide great tasting, hand-crafted locally, Irish beer bursting with flavours, aromas and textures which would appeal to both male and females. Their beer is natural, without any addition of chemicals or additives. The proposed beers are inspired by customers' feedback and also beers that the couple appreciates. Products from Crafty Divils Brewing Co.
Products Crafty Divils Brewing Co.